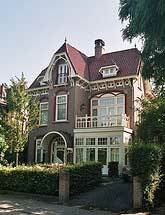 Nonresident individuals are liable to pay tax on income from sources in Netherlands. Married couples are taxed separately for their earned income in past or present employment while income from other sources may be freely attributed to one spouse. Spouses living permanently apart are taxed separately on all income. Income of the children is taxed in the hands of the parent who maintains the children. Taxable income under Box 1 category includes (1) past and present employment, (2) business activities, (3) other activities (cannot be considered employment or business), (4) periodical payments and pensions from individuals (e.g. alimony) or insurance institutions, (5) periodical payments received from the state and other public institutions (e.g. old-age pension), and (6) owner-occupied dwellings. Income from all sources mentioned is aggregated before deductions and tax credits are deducted. Income is then taxed at progressive rates. Included in the tax rates for the first two tax bands are national social security contributions, which is 27.65%. The actual income tax rates for the first two tax bands are 8.90% and 13.15% respectively. The tax rates for the last two tax bands do not include any national social security contributions. Included in the tax rates for the first two tax bands are national social security contributions, which is 31.15%. The actual income tax rates for the first two tax bands are 5.10% and 10.85% respectively. The tax rates for the last two tax bands do not include any national social security contributions. Taxable income under Box 2 category includes dividends and capital gains from a substantial shareholding. Income that falls into the Box 2 category is taxed at a flat rate of 25%. For year 2014, the tax rate is temporarily lowered to 22% for the first €250,000 of income, and income exceeding €250,000 is taxed at a flat rate of 25%. Taxable income under Box 3 category includes income from savings and investments. A flat tax of 30% is levied on the deemed yield of the net assets. The applicable deemed yield depends on the value of the assets. For 2017, there is a standard deduction of €25,000 for each individual. Until 2016, a fixed yield of 4% is taxed at a flat rate of 30%, resulting on a tax of 1.2% on the net assets. If a property is rented out, the taxation will take place in Box 3 at flat rate of 30% based on the assumption that a deemed rental yield is made on the net assets. As of 2017, the applicable deemed rental yield depends on the value of the assets. No capital gains tax is levied on the profits realized on the sale of Dutch real estate owned by a non-resident individual unless the non-resident is engaged in a trade or business in the Netherlands and the real estate is one of the capital assets of the business. If sale of real estate is part of a business enterprise, capital gains are taxed as part of income in Box 3 at a flat rate of 30% on the deemed yield of the asset. Real estate taxes are based on the value of the property and are paid by both the owner and the user. Each municipality is entitled to determine its own tariffs for real estate taxes which are applicable for four years. The tariffs (owner and user tariff) for the real estate taxes are typically between 0.1% and 0.3% of the property value. Besides real estate taxes, municipal authorities levy other taxes and charges such as building charges that are related to building permits. Such charges can be very high so a critical review is advised before payments are to be made. Other possible taxes include polder board taxes orland-draining rights, wastewater pollution tax and sewage system tax, sufferance tax, refuse matter tax, groundwater tax, ecological taxes and the energy tax. These taxes and their rates vary from municipality to municipality, so consultation with makelaar or notarisis necessary. Income and capital gains earned by companies are subject to corporate income tax. Income-generating expenses are deductible when calculating taxable income. The corporate income tax is levied at progressive rates.